Bedford, built in 1799, was the home of home of Daniel Bedinger and Sarah Rutherford. 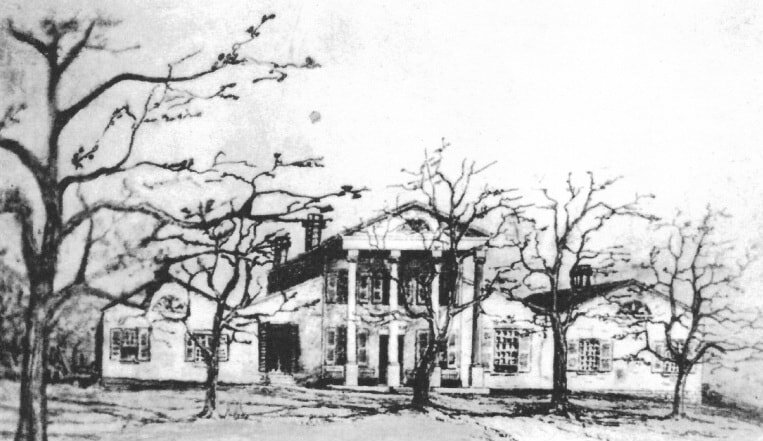 In 1798, Daniel resigned his position in the Customs House at Norfolk, Virginia; he acquired the property where his father had built the first Bedinger home near Shepherdstown. There, Daniel began to build a fine mansion. It was to be called “Bedford”. During the Civil War, Bedford was the home of Henrietta Bedinger Lee, Daniel's daughter, and her husband Edmund Jennings Lee. Then on ____,____ Bedford was burned by the order from General David Hunter, of the U. S. Army. The home was not rebuilt. Henrietta and her husband rebuilt the Lee home, Leeland, that had burned many years before, using many of the stones salvaged from the burned rubble of Henrietta's beloved childhood home, Bedford. In November of 1880, the "Bedford" property was sold. ​​Henrietta Bedinger Lee visited the remains of her cherished childhood home and wrote of her final good-bye visit to her ancestral home. "Anniversary of my beloved husband’s death. Three years a widow. The first dream I had after his death was short and brief and oh so comforting. He came to me and said, “Come with me and I will show you something beautiful”. November 6, 1880 - "The sale is not confirmed, so it is still mine. This day, Bedford, the home and birthplace of my dear Father and sisters as well as myself and two brothers, was sold. It has passed away forever from me. I have shed so many tears in the last ten years that I thought the font was dry. But when my boys came from town and told me Bedford was sold the sobs came up and my tears gave way. How I prayed that this portion of the wreck of my poor husband’s property might be kept for me. God alone knoweth. It has not pleased my Father to grant this prayer and I bow submissively and humbly to his will. No tie of earthly goods remains to keep me united to the world. My grasp upon perishable things is loosened and my wearisome journey to the end will be easier, 'Near to thee my God, nearer to thee even though it be a cross that raiseth me.' Thou hast given me the bread of adversity and the water of affliction, yet thine hand upholdeth me still." November 19, 1880: ​“'November winds howl idly by' This evening alone and sadly I turned my footsteps to Bedford. Now Bedford no more. The house and name dead. As I walked pensively over its once beautiful, now ruined grounds, I wondered what had been the especial sin of my forefathers that thus it was swept away from the earth with such destruction scarce one stone upon another to tell it had once been a beautiful stately habitation of joy and happiness, my grandfather’s home and my father’s birthplace as well as mine. And my heart asks, “who did sin, this man or his father?” that their home and memory are swept away from the children of men. Alas who can tell? Perhaps they reject the way, the truth, and the life” and this is the end. Ah me! Lovely homes are given us, but ruin and destruction follow the gift. I sat me down upon a part of the old foundation and wept aloud. Not even a bird heard the sobs as they welled up from my desolate heart. I called each dear familiar name of my childhood but none answered. There was neither voice nor sound. I stood in the ruin which was once my angel mother’s room and called blessed name of mother. But the cold gray sky only heard. I put my arms and faded grief worn cheeks upon every tree. My arms encircling the old decaying trunks and my cheek pressed to the bark as furrowed and almost old as the tree, yet my dear father planted them and in childhood I rest under their shade or with active and nimble limbs climbed and sat happily among the branches. Alas childhood! What a brief period. Visitations of dark grief and sorrow have been visited upon me. Such a checkered life that I almost am inclined to doubt I was ever a child. That period is so far away and the flowing shadows of the present so entirely envelope my existence. Oh why is it that we so cling to life. From cradle to grave tears are meted out to us. Has it been so with everyone born on earth? Yes! For all have sinned and sin brings sorrow and death. A beloved house is like a mother’s bosom, go from it afar, yet we can never forget or cease to love and cling to it. Often I wish I was miles and miles away from my scattered and ruined home, but here it is constantly before my eyes, saddened by what it is and what it was. The dear old beech trees where my angel sister Virginia and I played in childish merriment have all gone, dead or dying. My lovely sister’s poem written to unworthy me." The stream which wandered thro’ the wood. Of these loved scenes now, Henriett.